At least four distinct classes of introns have been identified: Introns in nuclear protein-coding genes that are removed by spliceosomes (spliceosomal introns) Introns in nuclear and archaeal transfer RNA genes that are removed by proteins (tRNA introns) Self-splicing group I introns that are removed by RNA catalysis. group I, group II: Introns in fungal mitochondrial genes and in plastid (chloroplast) genes have been grouped into two different groups based on different consensus sequences found in the introns. As we will see below, the group II introns have a mechanism for splicing that is similar to that of pre‑mRNA. In all cases, splicing will remove the introns and join the exons to give the mature RNA. Some precursor tRNAs contain short introns (only 10 to 20 nucleotides) with no apparent consensus sequences. These short introns are removed in a series of steps catalyzed by enzymes that include an endonuclease, a kinase and a ligase. Because the endonuclease generates a 2’, 3’ cyclic phosphodiester product, an additional phosphodiesterase is needed to open the cyclic phosphodiester to provide the 3’ hydroxyl for the ligase reaction. 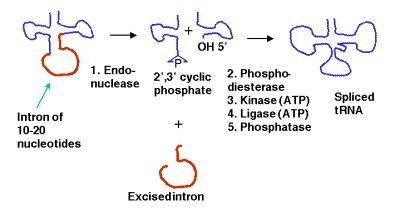 In addition, the 2’-phosphate (product of the phosphodiesterase) must be removed by a phosphatase. This process uses two ATPs for every splicing event. Fig. 3.3.9. Steps in splicing of pre-tRNA.